Suit yourself: Personalize the detailing and construction of your Pop Antique corset! A classic corset accessory, modesty panels sit between the corset's lacing and your skin, creating a unified look around the circumference of the corset and hiding the "Venus Fold" down your spine. Excellent for any corset which might be worn as a foundation or bedroom garment, these 3/4" garters are detachable via hidden loops inside the corset. Personalize the appearance of your detachable garters by having them covered in gently ruched matching fabric. By default, Pop Antique corsets in the majority of our house fabrics are made in a multi-layer construction. These corsets feature an organic cotton canvas strength layer, stabilized fashion fabric, internal bone casings, and a combination of spiral and flat steel bones. Strength and fashion layers can be upgraded to coutil for an additional fee. For more details about fit and construction, please read about The Pop Antique Distinction. Coutil is "the" corsetmaking fabric, tightly woven with as little stretch as possible. The single layer construction softens its firmness and is sleeker under clothing, molding beautifully to the form. Single layer corsets feature an exposed waist tape which draws further attention to the waist. I have many different construction techniques for single layer styles with both internal bone channels and external casings. See the Fabrics page for a list of currently available options. A modern classic, sheer corsetry is a variation on single layer construction featuring a strong and supple mesh fabric contrasted with solid fabric around all bone channels (including the busk). It shapes beautifully around the body, subtly revealing bare skin or contrasting fabric beneath. See the Fabrics page for a list of the currently available options. The different panels of your corset can be cut out in different fabrics to create a design detail known as "color blocking." One of my favorite design elements, color blocking can contrast two different colors, a color and a print, or even two different textures in the same color. Two examples of color blocking styles are shown to the side. The standard Pop Antique construction features a classic busk closure. A busk is a piece of specialty hardware that combines a hook-like closure with two 1/2" wide flat steel bones. Once you've practiced it a few times, a busk closure is very easy to use - just remember to loosen up your laces before attempting to unfasten your busk! A closed-front corset is smoother if it is to be worn as a foundation garment. Extra-long lacing allows you to pull your corset on over your head. For a different look, a corset may be laced down the front as well as the back. The front lacing should be worn closed, while the back gap is adjusted to your needs. Modernize your corset with a separating zipper. The look and structure becomes instantly updated; whether you're getting in or want easy-access out of your corset, a zipper is less fussy than a busk. An additional layer of lightweight cotton inside the corset. As well as hiding construction details like interior stitching, a lining prolongs the life of your corset by insulating the strength layer from your body's natural oils. All the same benefits as a floating lining and then some, the stitched-in lining is anchored at each seam. This technique makes the fabric lay smoother, and can therefore be used to fashion a reversible corset. More bones for more support! The second boning channel can be placed side-by-side with the original, or run down the middle of a panel, depending on the style. A contrasting or matching stripe of fabric over the corset's bone channels, further shielding your corset's bones from the cold, cruel world. Flossing is very much about form meeting function. This decorative embroidery also anchors and reinforces the ends of the bone channels, where they are under the most stress. 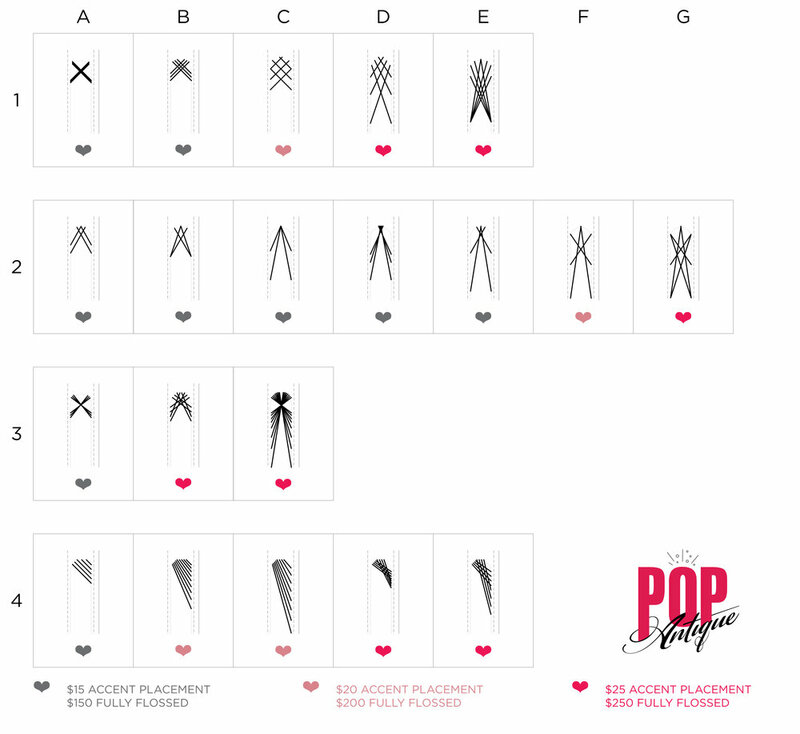 Price varies dependent upon the complexity of the flossed design and number of channels to be flossed; see sampler below. Feeling fancy? Like Christmas trees, there are many different ways to trim a corset, the most popular of which is lace along the top edge of of a corset. Exact price will depend on the cost of trim used, if the trim is placed in multiple locations, and the level of difficulty in placing it. Accent your nipped in waist by adding a wide satin sash in coordinating or contrasting fabric. Available stitched in or detachable. A classic wide, flared flounce along the bottom of the corset is a wonderful accent to smooth the transition from corset to skirt or trousers. Peplums are recommended in lightweight fabrics like cotton sateen or silk dupioni and may match or contrast the corset's base fabric. Flossing is very much about form meeting function (which is why I have listed it under both decorative and reinforcement upgrades). This decorative embroidery also serves in reinforcing the ends of the bone channels, where they are under the most stress. The sampler to the right shows some of the design possibilities with flossing. Price varies dependent upon the complexity of the flossed design and number of channels to be flossed (see the price key at the bottom of the sampler to the right). $15+ per symmetrically paired accent placement (i.e., one end of a boning channel, left and right sides both). Corsets fully flossed from $150. Corset Talk: The Wonderful World of Flossing - Blog post on The Lingerie Addict by Marianne Faulkner of Pop Antique. Corset Style Watch: Chic and Sheer - Blog post on The Lingerie Addict by Marianne Faulkner of Pop Antique.